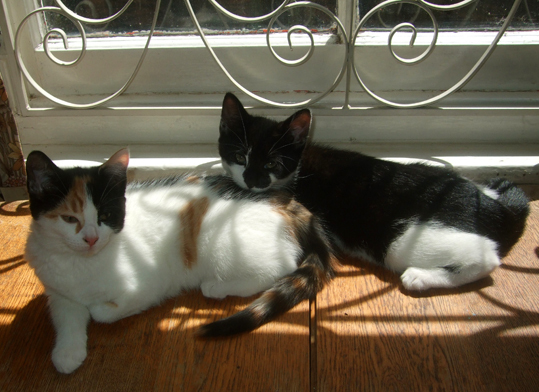 Here's a photo of my two new kittens - Tommy and Tuppence. They are named after the Agatha Christie sleuthing duo. Tommy is the black-and-white boy, Tuppence is the tortoiseshell-and-white girl. They are brother and sister and are 11 weeks old. I picked the kittens up on Friday evening and they have been settling into my home very well. They are playful and into everything, but this picture captures them resting in a sunbeam. After being catless for a several months since the old cat I adopted last summer - Pharaoh - died rather suddenly, Tommy and Tuppence have brought new life and joy into my home! I'll be sharing more photos of my kittens as they grow into cats, but if you have a picture of your cat or kitten you would like to send me to post on A Bad Witch's Blog, email me at badwitch1234@gmail.com.